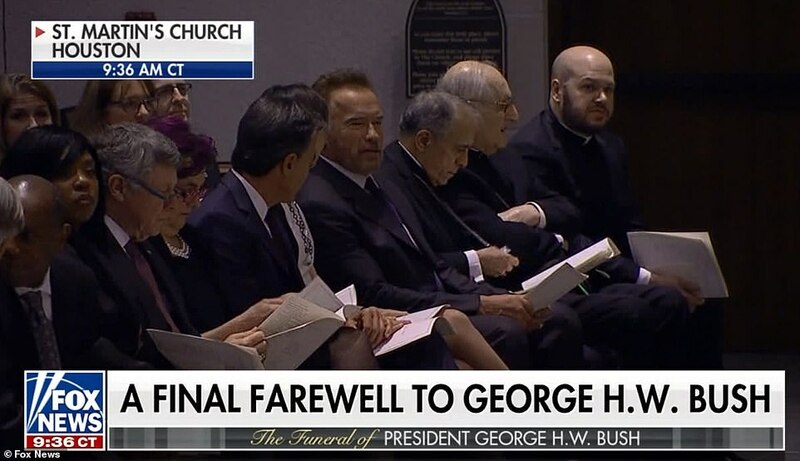 President George H.W. 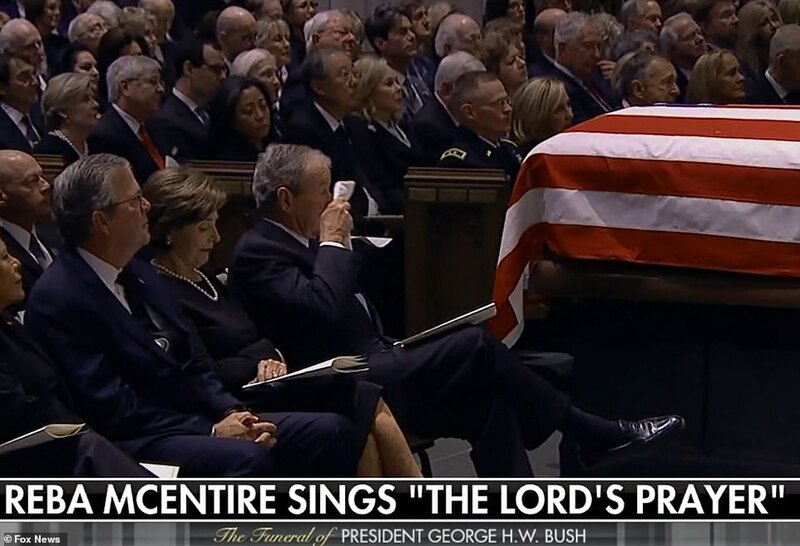 Bush’s extended state funeral began its final stages on Thursday in Houston, Texas, with the second imposing church memorial in two days – and his grandsons serving as honorary pallbearers. 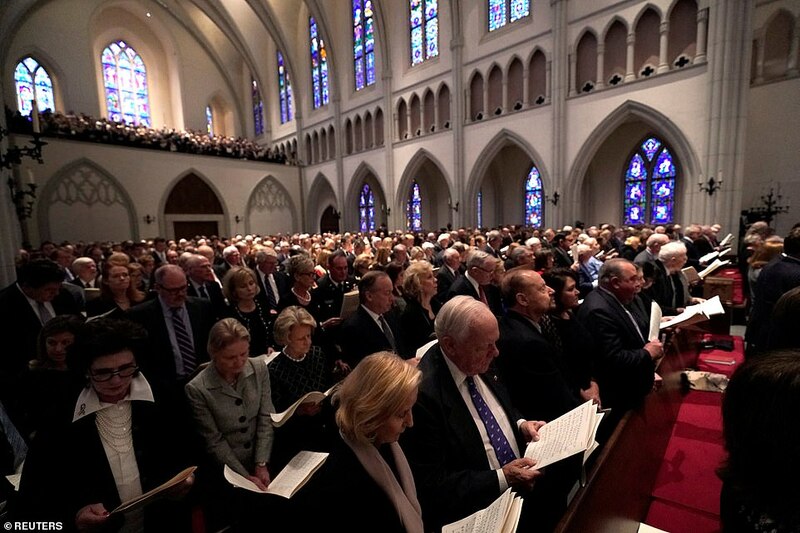 About 1,200 invited guests at St. Martin’s Episcopal Church included members of the 41st president’s family, Houston athletes and civic leaders who knew him as a service-minded American who invested more than four decades in merging his family’s values with America’s. 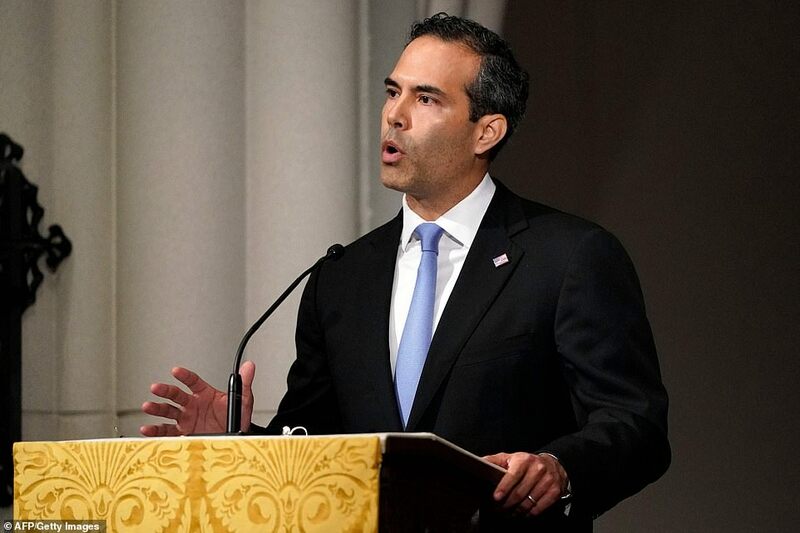 He was ‘the most gracious, most decent, most humble man I will ever know,’ said George P. Bush, the late president’s grandson who as the Texas land commissioner is the last current family member with a political future. ‘Power outage!’ George H.W. Bush would trash-talk if any metal shoe failed to reach the post. Overshooting the mark would draw a snarky ‘Woodrow Wilson!’ – a chuckle at the president who famously sought a law to suppress disloyalty and absolute authority to censor the press in wartime. 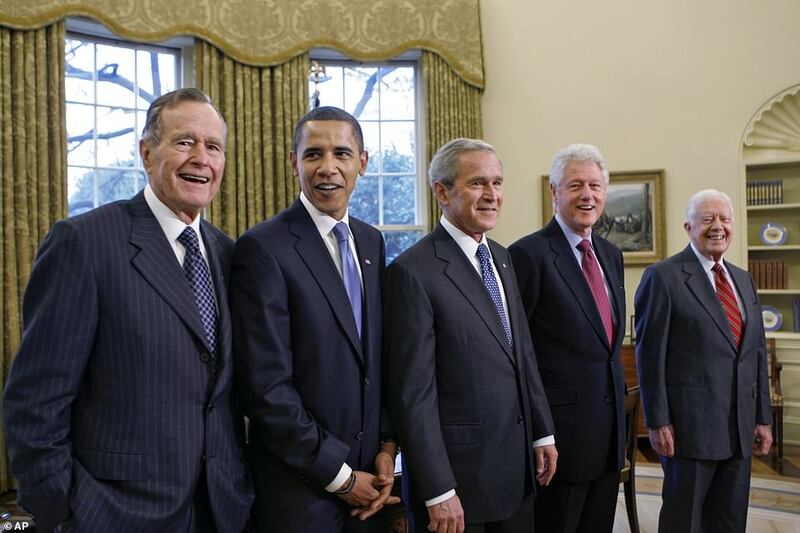 And in grandfatherly playfulness, the late president often ‘challenged all of the grandkids to the coveted ‘First to Sleep’ award,’ George P. said. 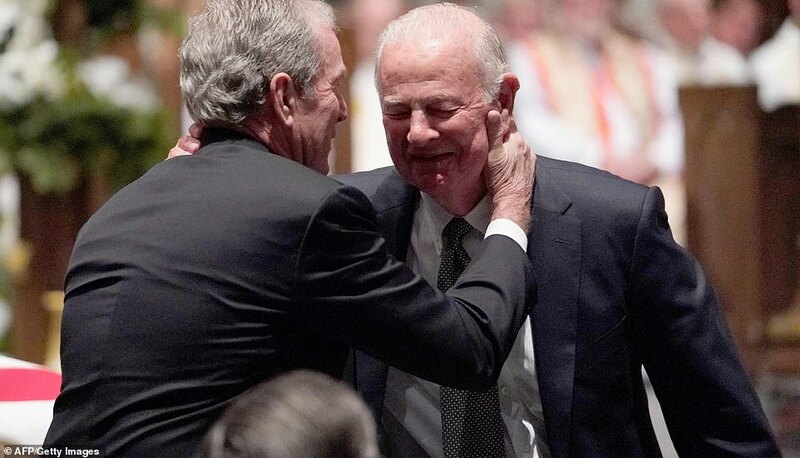 A more elderly Bush confidant, James Baker, said of the late president that ‘he’s been my friend and he’s been my role model.’ Baker served Bush as White House chief of staff and secretary of state. 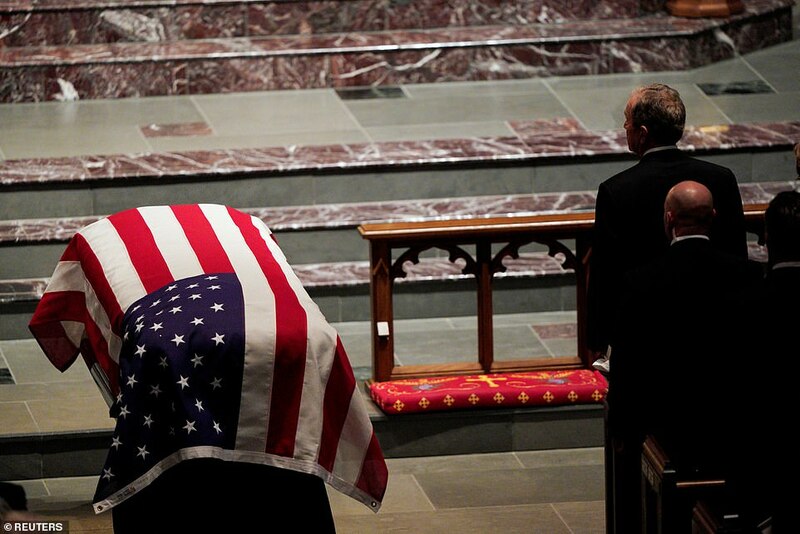 Wednesday’s awe-inspiring funeral at the National Cathedral in Washington was an unapologetic display of patriotic symbolism, with military escorts and flags of the 50 U.S. states flying above the length of the center aisle. 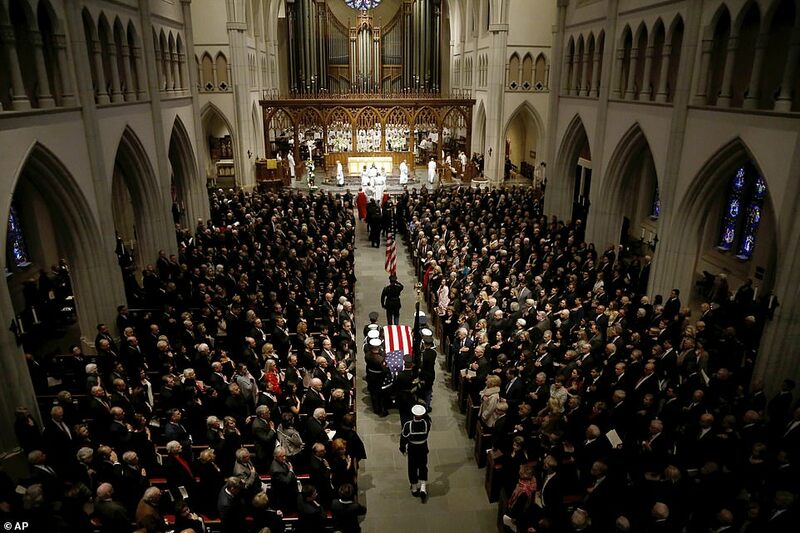 A church service a day later in a no-less-imposing space featured just two flags: the stars and stripes draped over Bush’s casket and carried in front of it. The church choir rendered ‘This is My Country’ as a worship anthem and the National Anthem with pipe organ and soprano descant. ‘America the Beautiful’ was sung as a congregational hymn. 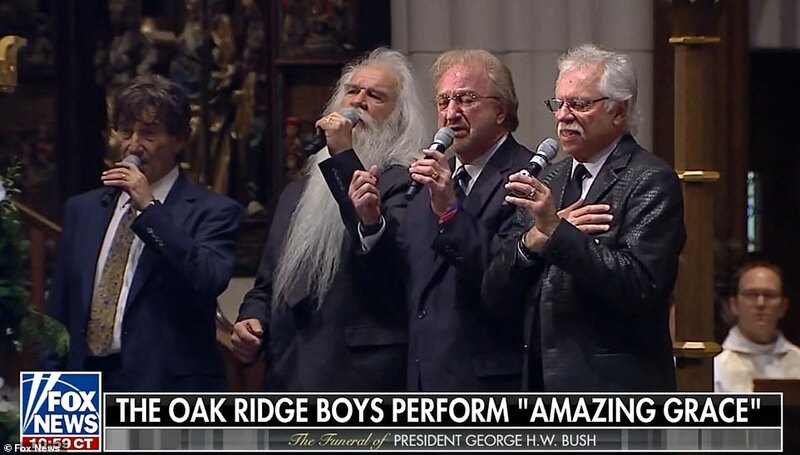 And while Wednesday’s musical centerpiece was famed tenor Ronan Tynan singing a showstopper based on Abraham Lincoln speeches, the Texas service featured the Oakridge Boys singing ‘Amazing Grace’ and a version of The Lord’s Prayer performed by country star Reba McIntyre. 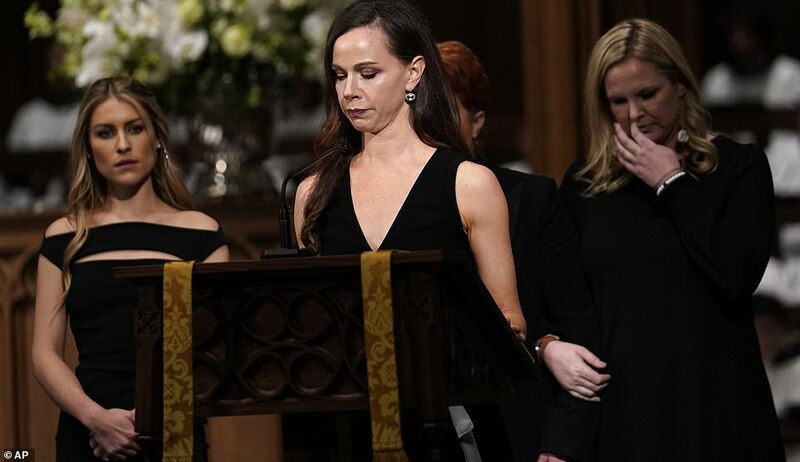 Barbara Pierce Bush, one of former President George W. Bush’s twin daughters, read the 23rd Psalm along with two of the late elder George Bush’s other granddaughters, Elizabeth Dwen Andrews and Noelle Lucila Bush. Noelle is the daughter of former Florida Gov. Jeb Bush, George W.’s brother. 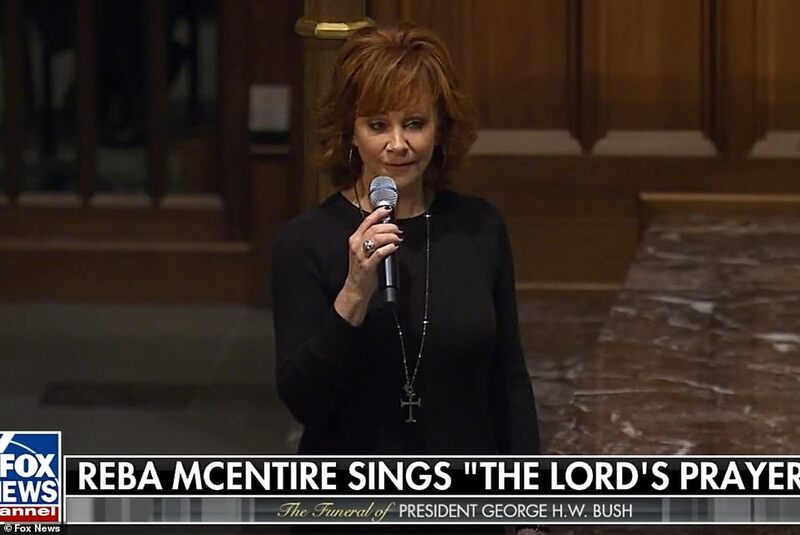 Marshall Lloyd Bush, the adopted daughter of their brother Marvin, read from the Old Testament. 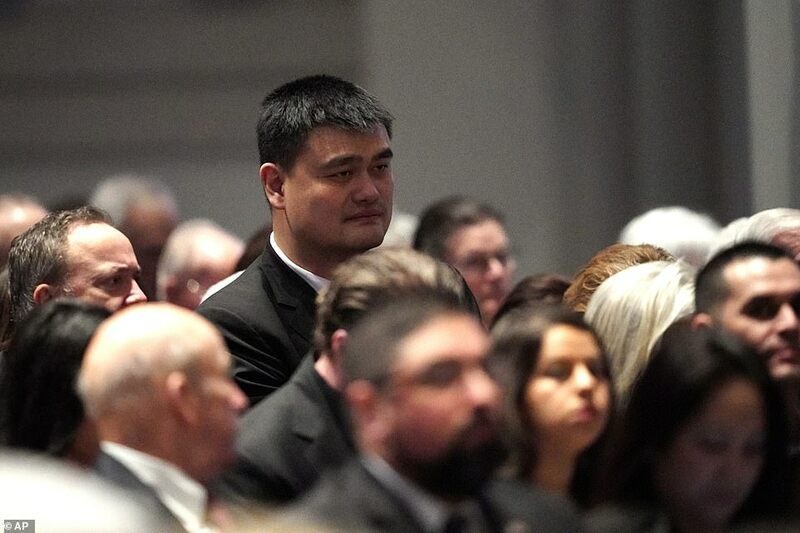 Former Houston Rockets stars Yao Ming and Dikembe Mutumbo were among the mourners on Wednesday, their 7-foot heights elevated above the crowd. 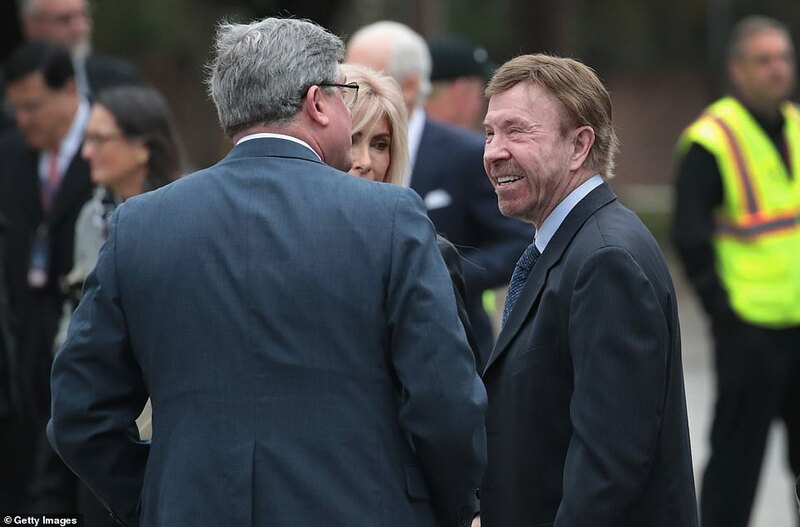 Movie star Arnold Schwarzenegger, a former California governor, sat near the front. His bromance with the elder George Bush was well-known during his presidency. 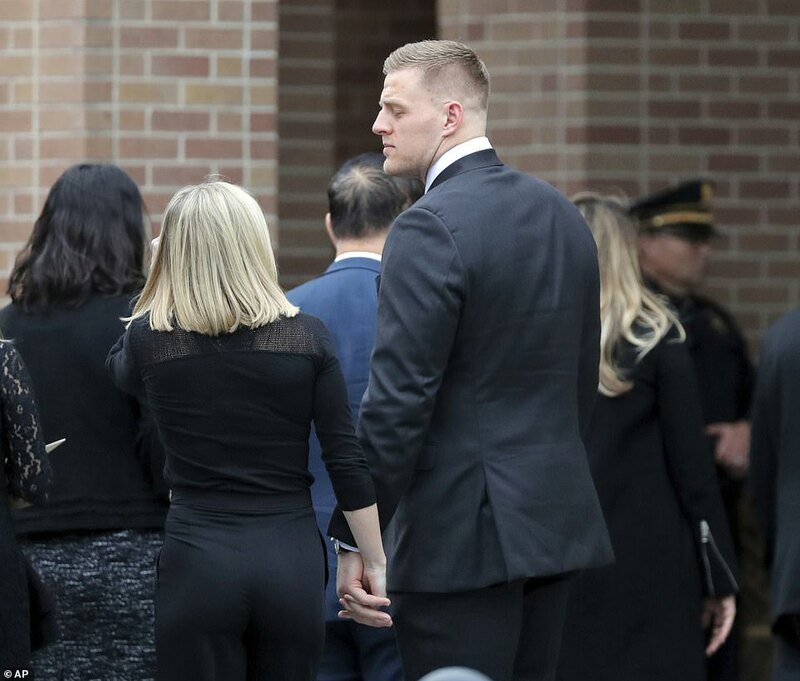 After the funeral at the church, his casket will be taken by train 70 miles from Houston to Texas A&M in a clear-sided baggage car that hails from the golden era of railroads. 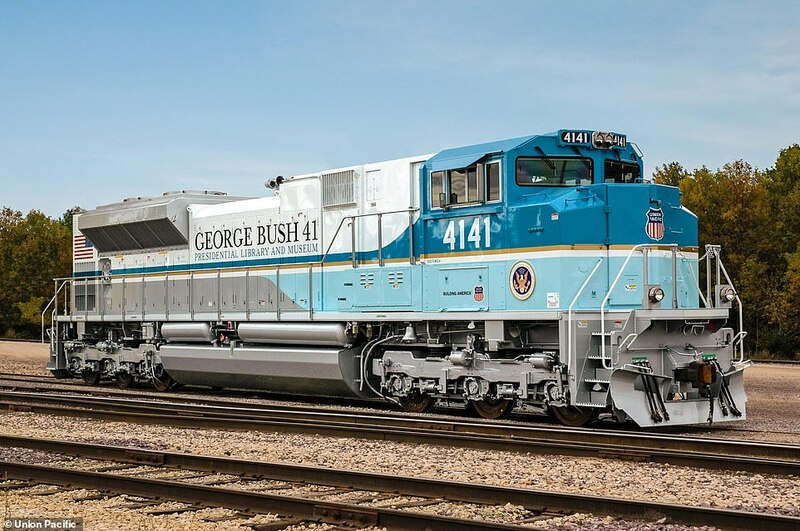 The locomotive carrying his body was painted to resemble Air Force One, and Bush joked that if it had been around during his presidency, he may have preferred to ride the rails rather than take to the skies. 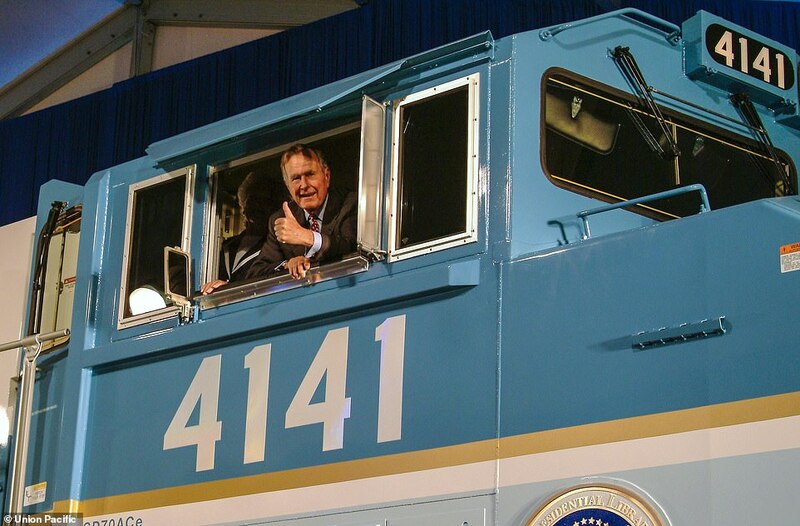 ‘I might have left Air Force One behind,’ Bush quipped during the 2005 unveiling of 4141, a blue and gray locomotive commissioned in honor of the 41st president and unveiled at Texas A&M University. 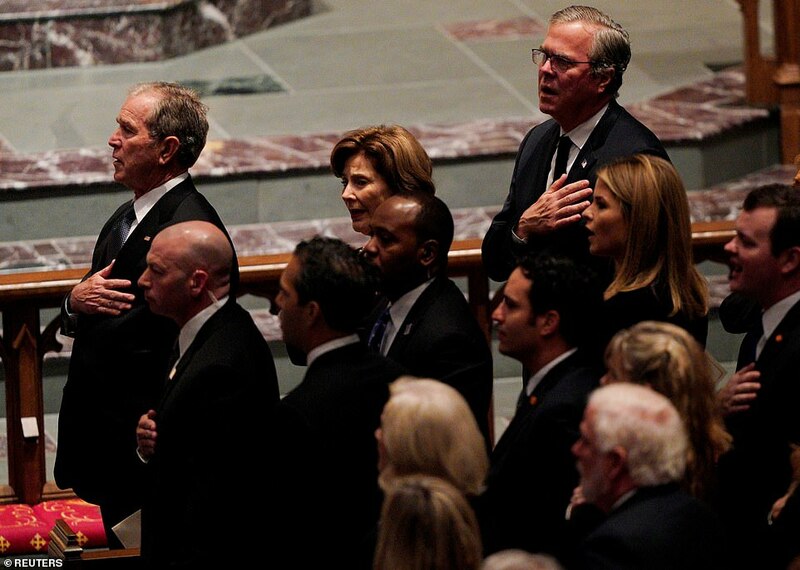 Former U.S. President George W. Bush stands next to the casket of his father, former U.S. President George H.W. 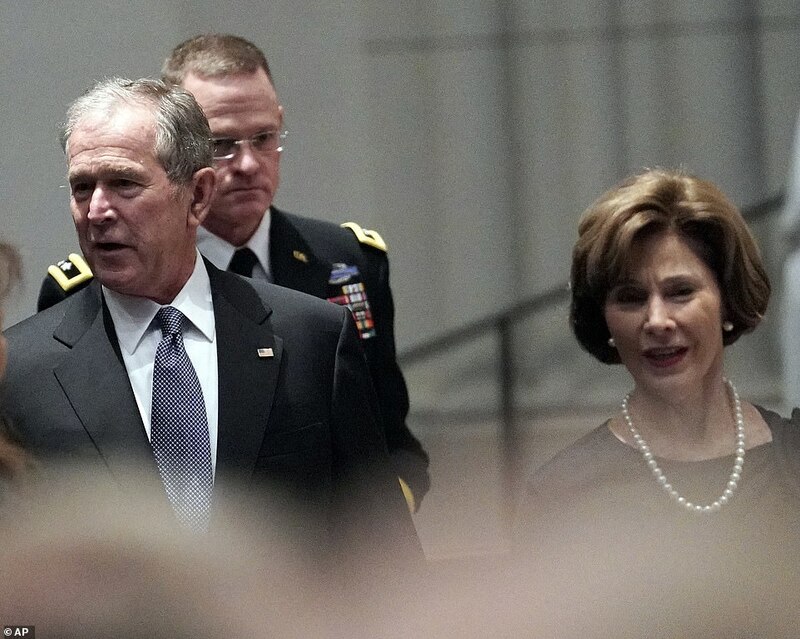 Bush, during his funeral service at St. Martin’s Episcopal Church in Houston, Texas, U.S.
Former president George W. Bush and his wife Laura arrive to the church on Thursday morning. 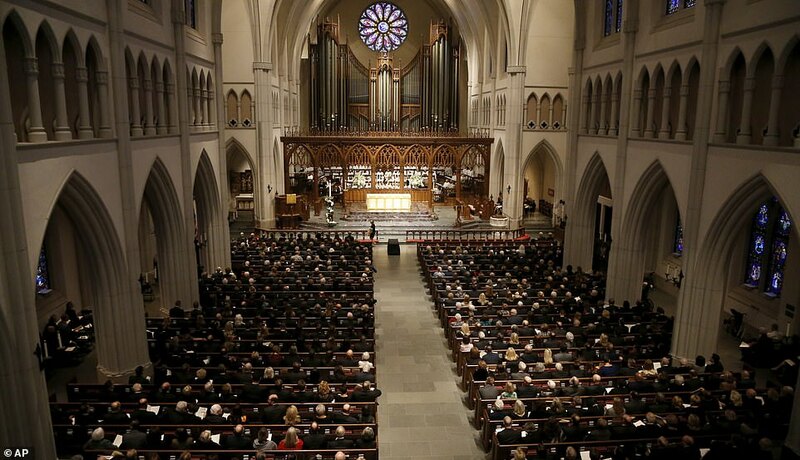 On Wednesday, George W. gave a moving and tearful eulogy for his father in Washington D.C.
Today, that same 4,300-horsepower machine will carry Bush’s casket, along with relatives and close friends, for around 70 miles. The journey through five small Texas towns was expected to take about two and a half hours. It will deliver the casket from suburban Houston to College Station. The train’s sixth car, a converted baggage hauler called ‘Council Bluffs,’ has been fitted with transparent sides to allow mourners lining the tracks views of Bush’s flag draped coffin. 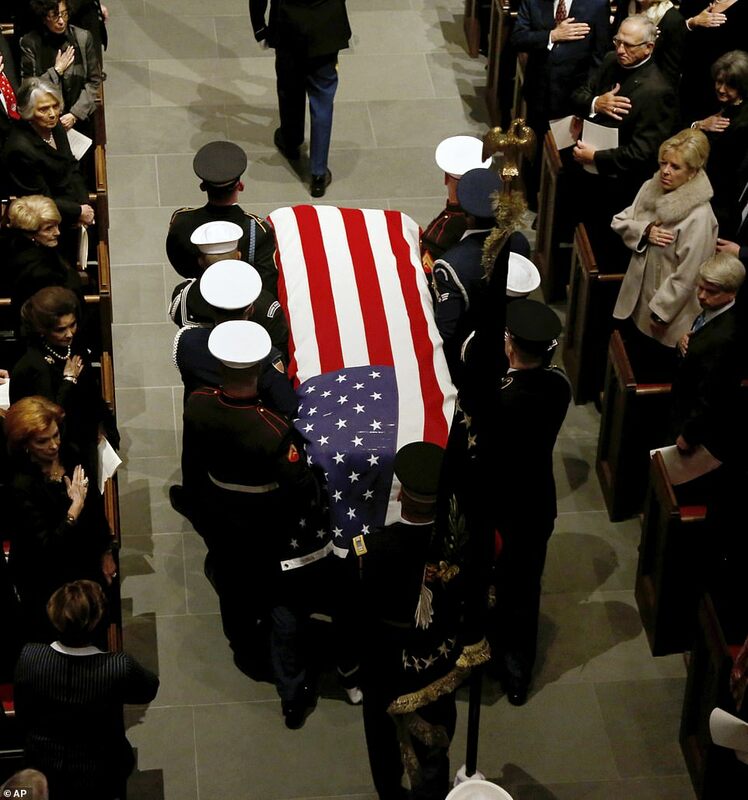 Bush, who narrowly escaped death as a naval aviator who was shot down by Japanese forces over the Pacific Ocean in World War Two, will be buried with military honors, including a flyover by 21 aircraft from the U.S. Navy. 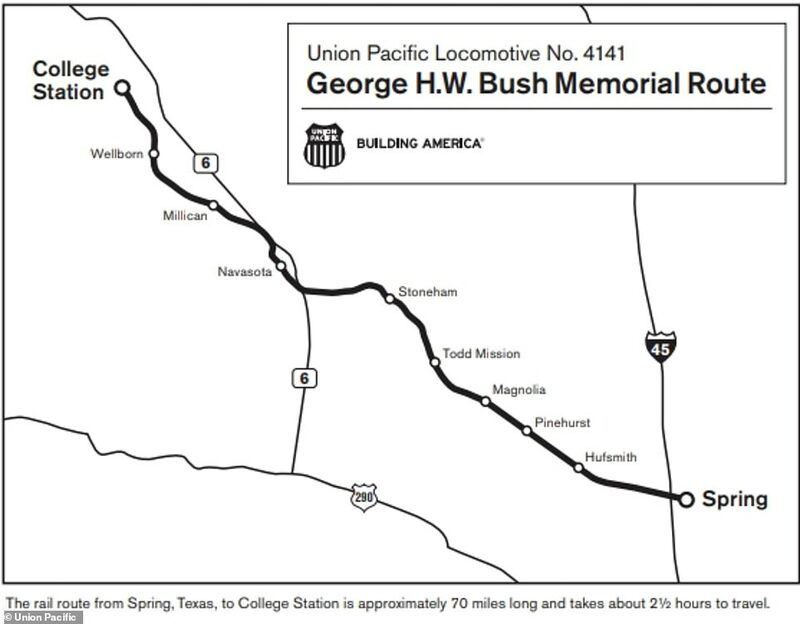 Bush’s funeral train will be the eighth in U.S. history and the first since Dwight D. Eisenhower’s body traveled from the National Cathedral in Washington through seven states to his Kansas hometown of Abilene 49 years ago. Abraham Lincoln’s funeral train was the first, in 1865. Robert F. Kennedy was never president, but he was running for the White House when he was assassinated in Los Angeles in 1968.